MicroUAV is excited to offer complete, custom lighting solutions for unmanned vehicles, experimental aircraft and other unusual needs. Our fully equipped machine shop combined with our full complement of electronic design and production capabilities means we handle the entire design process in-house to create the perfect solution for your unique needs without the high prices of other custom solution providers. We specialize in lightweight, aerodynamic fixtures for any position. We can easily and quickly produce any drive circuitry to meet any voltage, flash pattern, intensity and synchronization requirements. We can produce units not only in any visible wavelength required but also in the infrared and near-ultraviolet spectrums. Contact us for a customized quote., or browse our production hardware below. Our existing lighting and identification line of products shows our commitment to light weight, small form factor, and reliability through our custom heat sinking and mounting solutions. All necessary electronics are built into the lighting unit requiring no external driver boxes. These systems are nominally 24 - 28 volts but are also available in a 12 volt version. Synchronization of any combination of two or more flashing units is available through a single sync wire. All electronics and drivers are included in the light units themselves eliminating the need for additional driver boxes. These units are designed to meet or exceeed FAA standards. However, they are currently not covered by STC. This means that they can be used for experimental aircraft as well as unmanned air vehicles. 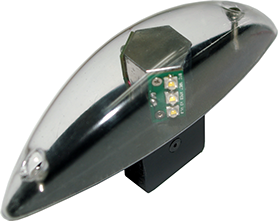 Our Wingtip Navigation & Position lights are designed to be easy to install, while remaining durable and lightweight. These units are normally wingtip mounted. A polycarbonate lens protects the LED optics and provides an unobstrcuted 180° viewing angle. The lights allow for the navigation (red and green) and the anti-collision strobe to be operated independtly. Strobing can be synchronized with other flashing units by running one sync wire. The LEDs are mounted to a specially designed finned baseplate that acts as a heat sink to ensure long life operation. This unit is a wide angle floodlight for maximum visibility but features highest intensity of light straight ahead and 20° down. 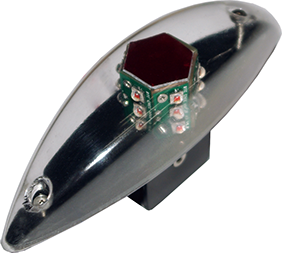 The Beacon light provides a 360° red strobe or fade in high intensity Aviation Red (625nm) LED's. 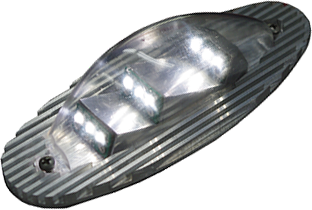 The Beacon light is available with a pulsing or fading flash pattern of approximately 1 hz. The Beacon can be synchronized with other flashing units by running one sync wire. 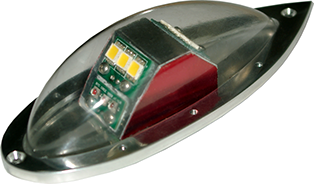 The Anti-Collision Strobe provides a 600 lumen flash of light at approximately 1 hz that can be viewed for 230° to the rear of the aircraft. The Anti-Collision can be synchronized with other flashing units by running one sync wire.